Do you enjoy Bible Trivia? You have come to the right place! Studying and applying the Word of God is the most important thing we can do in life. On this page you can start an exciting treasure hunt through the Book of Genesis. There are ten questions on this page. You must answer each question correctly and then follow the directions in the Password Decoder. This will give you the password to get to the next page. 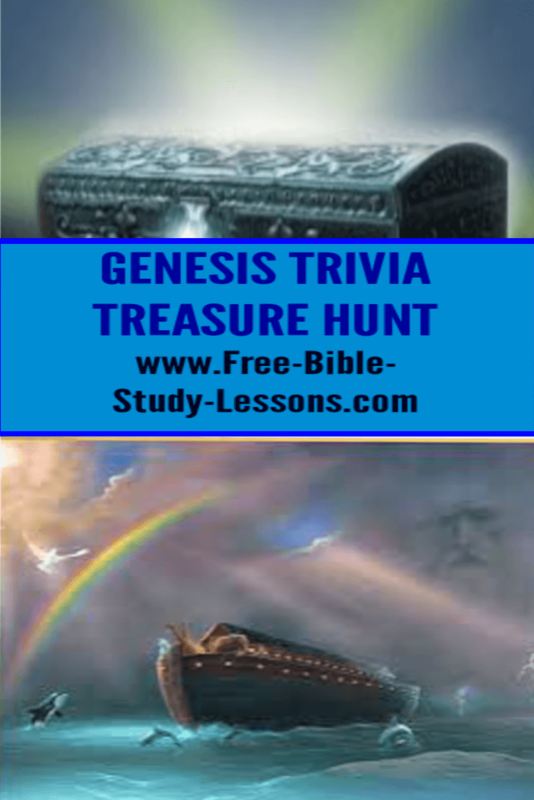 Each page has Interesting Genesis Facts, Ten Bible Trivia questions, and the password decoder. There are ten pages and then the final Treasure Page. 1. Correctly answer each Bible question. All the answers to these Bible questions are found in the Book of Genesis. You may use either the King James Version or the New International Version. If you are using a different version and can't get the password to work, check out the reference in the KJV or NIV to see if they used a different word/spelling. 2. Make a note of each answer. If the answer is a number, write out the number, i.e. nine not 9. You may also want to make a note of the reference in case you need to double check your answers. 3. After you have all ten Bible trivia answers, go to the Password Decoder section and follow the instructions there. Write down each letter of the password in order until you have completed the password. Note: The password is not an actually word but a random list of lowercase letters - no spaces. 4. Save the password because you need it at the end to decode the Secret Verse. E. If this still does not work you may send me an e-mail with your answers AND the Bible reference where you found the answer and I will let you know if you have a wrong answer. NOTE: Do not e-mail me to ask me what the answers are. I will not tell you. This is YOUR Treasure Hunt. So get out your Bible, turn to Genesis and start digging! You can work this out yourself or you can challenge your friends, youth group, or others, to a race to see who can get to the treasure page first. On the Treasure Page is a Secret Verse [for which you will need your ten passwords to decode]. If you are challenging others, then the first one to decode this secret verse on the last page is the winner. Others can verify the correct answer when they reach the final page and decode the secret verse for themselves. Genesis is the Book of Beginnings. It is the foundational book of the Bible. In it we discover the answer to the age-old questions of mankind like: Why am I here? Does my life have a purpose? Why is there sickness and pain? Can I know God? How did it all begin? Plus much more. In fact, every major teaching in the Bible has it’s beginnings in the Book of Genesis. It is a vital book to know. Enjoy your Bible trivia treasure hunt. Points to Ponder: Since Eve ate of the forbidden fruit first, why is Adam the one who introduced sin into the world? 1. Was the Flood local or global? 2. What was Leah’s daughter’s name? 3. What was Sarah’s name to begin with? 5. How many cows altogether did Pharaoh see in his dream? 6. Rebekah wanted Jacob to flee to her brother ___________. 8. Which was created first, the sun or light? 9. Esau became a skillful or cunning ________________. 1. Take the first and third letters from the first answer for the first two letters in the password. 2. Take the first and third letters from the second answer for the third and fourth letters in the password. 3. Take the first and last letters from the third answer for the fifth and sixth letters in the password. 4. Take the fourth letter from the fourth answer as the seventh letter in the password. 5. Take the fifth letter from the fifth answer as the eighth letter in the password. 6. Take the second and fourth letters from the sixth answer as the ninth and tenth letters in the password. 7. Take the first letter of the second word in the seventh answer as the eleventh letter in the password. 8. Take the middle letter from the eighth answer as the twelfth letter in the password. 9. Take the first and last letters from the ninth answer as the thirteenth and fourteenth letters of the password. 10. Take the last letter from the tenth answer as the fifteenth letter of the password.